Justina Pelletier’s mitochondrial disease: Boston Children’s Hospital suspects medical child abuse. Mitochondrial Disease or Medical Child Abuse? 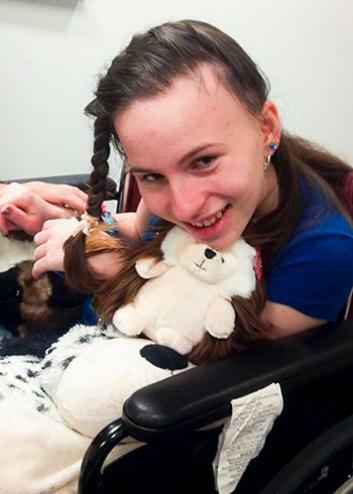 Justina Pelletier’s case is a study in diagnostic challenges. It’s difficult to know what’s really going on with Justina Pelletier. Linda and Lou Pelletier brought their daughter to Boston Children’s Hospital last year. They were looking for a gastroenterologist to help with 14-year-old Justina’s mitochondrial disease, a rare disorder that causes widespread and nonspecific symptoms. Justina Pelletier never saw a GI specialist, though. Instead, she officially became a ward of the state last week. The physicians at Boston Children’s concluded that Justina did not have mitochondrial disease. They believed that her symptoms were the result of psychological stress, caused in part by her parents. They accused the Pelletiers of subjecting Justina to dangerous and unnecessary medical treatments. When the hospital petitioned the state to take custody, the Boston Globe picked up the story and painted an unflattering picture of both the state government and the doctors at Boston Children’s Hospital. It’s easy to get angry about this scenario—and there are some troubling things about the way the conflict has been managed—but the doctors at Boston Children’s deserve a defense. First, we’re essentially hearing only one side of the Justina Pelletier story. Neil Swidey and Patricia Wen, the reporters covering the story for the Boston Globe, have done an admirable reporting job, but hospitals can’t say much about their patients. Linda and Lou Pelletier appear to have provided much of Wen and Swidey’s information. Second, the science is complicated. Mitochondrial disease (Justina Pelletier’s original diagnosis) and medical child abuse (the Boston Children’s diagnosis) can look extremely similar. Both can be deadly if not treated properly. Mitochondrial disease is a broad category of disorders caused by defects in how energy is produced within cells. The disease can manifest almost anywhere in the body, and symptoms vary widely between patients. The most common symptoms are neurological, because the nervous system demands a large amount of energy. Weakness, poor reflexes, fainting, and headaches are classic symptoms of mitochondrial disease, but even those occur in only 45 percent of sufferers. Liver disorder, abnormal heart rhythms, and kidney failure are also documented symptoms. Justina Pelletier exhibited some of the symptoms associated with mitochondrial disease. Her speech was sometimes slurred, she had difficulty walking even short distances, and she had severe digestive problems. Her sister had also been diagnosed with the disease. Based on media reports, a mitochondrial disorder seems a plausible explanation. “Mito,” however, is incredibly difficult to diagnose definitively. Weakness and headaches are symptomatic of hundreds of diseases. Even when combined with chronic fatigue or poor digestion, the list of possible causes remains long. No single test has proven effective at both detecting mitochondrial disease and ruling it out. It is also rare: Mitochondrial disease is believed to occur in approximately one in 8,000 children. The doctors at Boston Children’s who rejected Justina’s mitochondrial disease diagnosis identified two red flags. First, many physicians attempting to diagnose the disorder look for an accumulation of mitochondria in the cell membranes of skeletal muscles. This finding is often called the “hallmark of mitochondrial disorders.” Media reports suggest that Mark Korson, Pelletier’s doctor at Tufts Medical Center, declined to take a muscle biopsy before diagnosing her with mitochondrial disease. In addition, the doctors at Boston Children’s pointed out that Pelletier’s levels of plasma amino acids and other common blood markers of mitochondrial disease appeared normal. This doesn’t mean Korson’s diagnosis was wrong. Patients with mitochondrial disease have extreme difficulty with pain and handle anesthesia poorly, so some doctors avoid muscle biopsies. And not all mitochondrial disorders manifest in blood tests. Still, the doctors at Boston Children’s were suspicious. They were also aware that there’s another, more sinister, problem with mitochondrial disease: The diagnosis is sometimes used as a cover for medical child abuse. Also called Münchausen, or hypochondria, by proxy, medical child abuse is the parental practice of subjecting children to unnecessary and dangerous medical care. The parents go from doctor to doctor, dissatisfied when the physician fails to produce a significant, profound, or rare diagnosis. Medically abused children have usually undergone several procedures, some of them risky. They show signs of anxiety that abate when the parent is absent. A 2011 study of medical child abuse cases published in the journal Pediatrics suggested that many medical child abusers seek out a diagnosis of mitochondrial disease, in part because it guarantees a long period of heavy involvement with the medical system. Although the study’s sample size was small, the numbers are still deeply troubling: More than half of children subjected to medical child abuse had been tested for mitochondrial disease. Just as Justina Pelletier exhibited some symptoms consistent with mitochondrial disease, her case also has some of the hallmarks of medical child abuse. One of her chief complaints was digestive trouble, the most common symptom among medically abused children. She had gone through extreme surgical procedures, including the placement of a permanent port in her belly to flush her digestive tract. Her parents had engaged in physician shopping, and experts at Boston Children’s felt that Justina’s emotional state improved when her mother left the room. Mark Korson, the Tufts doctor who diagnosed Justina Pelletier with mitochondrial disorder, has criticized the doctors at Boston Children’s on several grounds. First, he argues that there are no objective tests for the diagnosis they have made, which represents nothing more than a “best guess.” True enough, but Boston Children’s could lob a similar accusation back at him, especially considering he apparently declined to use one of the few diagnostic tests available for mitochondrial disease. Korson also accuses Boston Children’s of taking extreme measures: “[T]he team has demanded that Justina be removed from the home and severe restrictions imposed on contact with her parents. This represents the most severe and intrusive intervention a patient can undergo.” That statement is debatable, to say the least. Separating a child from her parents, although admittedly traumatic, is easily reversible and carries no risk of death. Installing a permanent port entails significant surgical risk, and such ports frequently become infected. The doctors at Boston Children’s had few options if they really believed in their diagnosis. Just as the treatment for strep throat is antibiotics, the treatment for medical child abuse is separating a child from her parents. Sending Justina Pelletier home would have represented the height of irresponsibility if their diagnosis was correct. One in 10 children who suffers medical abuse eventually dies at the hands of his or her parent. New technologies are coming onto the market that should improve the diagnosis of mitochondrial disease. Courtagen Life Sciences recently released a test that examines all of the genes that govern mitochondrial function. The test, however, is expensive and not yet widespread. Hopefully improvements in diagnosis will blunt the disease’s power as a weapon of medical abuse. Linda and Lou Pelletier may be the innocent victims of an all-powerful hospital that followed a misdiagnosis to its painful and damaging end. Or perhaps they are sick people who have tortured their daughter with unnecessary medical procedures. They could even be both—the parents of children with mitochondrial disease often suffer from the same disorder, which can cause emotional and psychiatric problems, including in some cases Münchausen. It may be a long time before we know who was right in this case. Even then, it may be wrong to assign blame.